The team of Real Art on Wheels is very grateful to participate in the 90th anniversary of the Mille Miglia. We will be driving in our FIVA A1 classification Peugeot 203 from the Darl’ Mat garage in Paris. You see Bodie Hage and Gaby Bezemer driving with start number 375. During the Mille Miglia our office is closed, we thank you for your understanding. In the year of its ninetieth anniversary, the thirty-fifth edition of the re-evocation of the race created in 1927 was presented, the race that Enzo Ferrari called “a unique travelling museum”. Huge enthusiasm and vastly increased participation requests. The Mille Miglia 2017 route varies slightly compared to the 2016 edition: there is great interest in the four-stage race which crosses the historical centres of some of the most charming cities in Italy. From Thursday 18 to Sunday 21 May, the race will travel through more than 200 municipalities and 7 regions in Italy, as well as the Republic of San Marino. Among the novelties, worthy of mention are the “showcase trials” to be held in some historic squares, by the 440 accepted cars. There will also be celebrations to remember the 24 original editions of the race, which took place from 1927 to 1957. The race that will take place from Thursday 18 to Sunday 21 May 2017 will be the thirty-fifth re-evocation of the Mille Miglia, the most famous road race of all time, ninety years after the first of the 24 editions of the speed race, from 1927 to 1957. The celebratory trademark of this ninetieth anniversary groups together the distinctive symbols of our history: such as the connection between the numbers “9” and “0”, representing the symbol of infinity, perpetual motion along a road that ideally crosses Italy. Furthermore, in tribute to the two different automobile races, the speed race of the past and the regularity race of the present. The logo also incorporates the hub of a wheel and a stopwatch button. For the fifth year running, 1000 Miglia Srl will be running the great automobile event. The company is a subsidiary of Automobile Club Brescia. The enthusiasm for the most admired “travelling museum” in the world continues to spread to enthusiasts on all five continents. 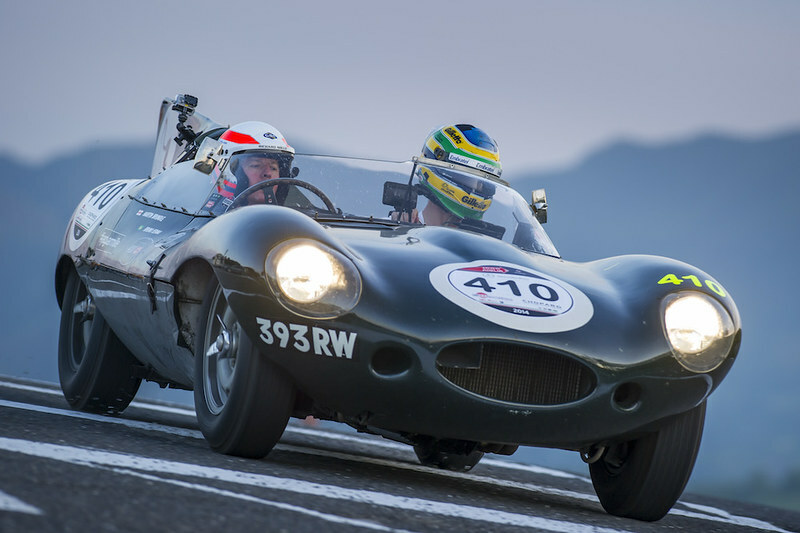 Registrations for Mille Miglia 2017 have continued to increase. The examining committee will inspect 695 vehicles, all manufactured from 1927 to 1957: the list of the 440 vehicles accepted will be revealed in one month’s time, at the Geneva International Motor Show. Next May, Brescia will once again experience the pomp and splendour that made it the capital of motor racing: over and above the various initiatives to celebrate the ninetieth anniversary, the 2017 edition will begin with the preview of Tuesday 16 May. The city streets will be the backdrop for the Roberto Gaburri Trophy, a regularity race which will have about one hundred participants. In 2017, Mille Miglia will continue to be run over four stages. After checks and stamping, which will, as always, take place at Fiera di Brescia and proceed to Piazza della Vittoria, the start of the Mille Miglia 2017 will be from Viale Venezia, at 14:30 on Thursday 18 May. In keeping with tradition, which began in 1927, the route will start and end in Brescia, crossing half of Italy, with the turning point in Rome. The route is changed every year in order to allow Mille Miglia to return to areas it has not been to for a few years. From Brescia, after the classic drives past Garda Lake, and after passing Verona, the 440 cars in Mille Miglia will head toward Vicenza, ending off the first stage in Padova. The day after, 19 May, the second stage will take the competitors to Rome. In order to take into account all the requests and in compliance with the idea of alternating, in 2017 Freccia Rossa will not follow the Adriatic Coast southwards, but will move towards the hinterland, crossing Umbria. Leaving from Padova at 6.30, the vintage cars will pass through Ferrara, Ravenna, San Marino, Urbino, Gubbio, Perugia and Terni. Arrival in Rome is envisaged around 21h15, with the parade in Via Veneto and the customary nocturnal tour of the heart of the city. Saturday 20 May, the day will begin at 6.30, the route from the Capital will remain unchanged up to Tuscany. This is the most classic part of the route and will cross through Ronciglione, Viterbo, Radicofani and Siena, with the indispensable show in Piazza del Campo. From here, in answer to various requests, Mille Miglia 2017 will travel northwards passing through Montecatini Terme and Pistoia, crossing the Apennines along the Passo dell’Abetone, descending onto the plane from Reggio Emilia to Modena. The third stage will end in Parma, which always warmly welcomes the participants. From here on the morning of Sunday 21 May, the day will start at 7.00. Travelling through the Pianura Padana, the long line of Freccia Rossa vehicles will cross Cremona and Mantova. Continuing in its promotion of the territory around Brescia, with its characteristic attractions and products, lunchtime will be spent in Rovato, where the competitors will be able to taste delicacies such as the traditional manzo all’olio (Beef with oil). Arrival on the final leg will lead the teams onto the ramp to take the chequered flag in Brescia. The programme and route of the Ferrari Tribute to Mille Miglia and the Mercedes-Benz Mille Miglia Challenge will be the same as that for Mille Miglia, with the exception of the start and arrival of the first stage, on Thursday 18 May, which will be in Desenzano del Garda (from 13h45) and in Ferrara (from 21h00) respectively. The main novelties of the 2017 edition will concern the competitive aspect with a considerable increase in the number of time trials, which increase to 112, plus 18 readings in 7 set average tests. The final classification, after the application of coefficients (unchanged following the changes done last year) will comprise a total of 130 timed stages. Among these, for the first time, Mille Miglia will hold a few “showcase trials” in the squares of Verona, Castelfranco Veneto, Ferrara, Pistoia, Busseto, and Canneto sull’Oglio. The last timed trials of Mille Miglia 2017, decisive for the ranking, will take place in an extraordinary setting: the runways of the 6th Squadron Tornadoes at Ghedi Military Airport.